Product #2575 | SKU AT2041SP | 0.0 (no ratings yet) Thanks for your rating! 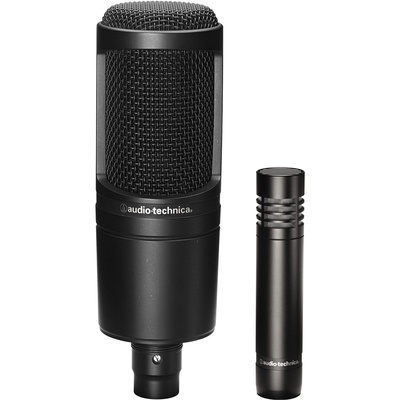 The Audio-Technica AT2041SP is a recording microphone package configured to suite any recording budget. The package consists of the AT2020 cardioid condenser microphone and AT2021 small-diaphragm condenser recording microphone. The combination of the two microphones provide the flexibility to accurately record vocals and instruments in project and home recording studios. The microphones exhibit a wide frequency response and cardioid polar patterns for accurate detail and minimal residual noise. The AT2020 is a side address large diaphragm condenser that's well suited for vocal capturing. The AT2021 small diaphragm condenser microphone captures instruments in rich detail and minimal noise. The AT2020 includes a pivoting, threaded stand mount while the AT2021 includes a professional stand clamp. Maximum Input Sound Level AT2021 : 145dB SPL, 1 kHz @ 1% T.H.D. AT2020 : 144dB SPL, 1 kHz @ 1% T.H.D.